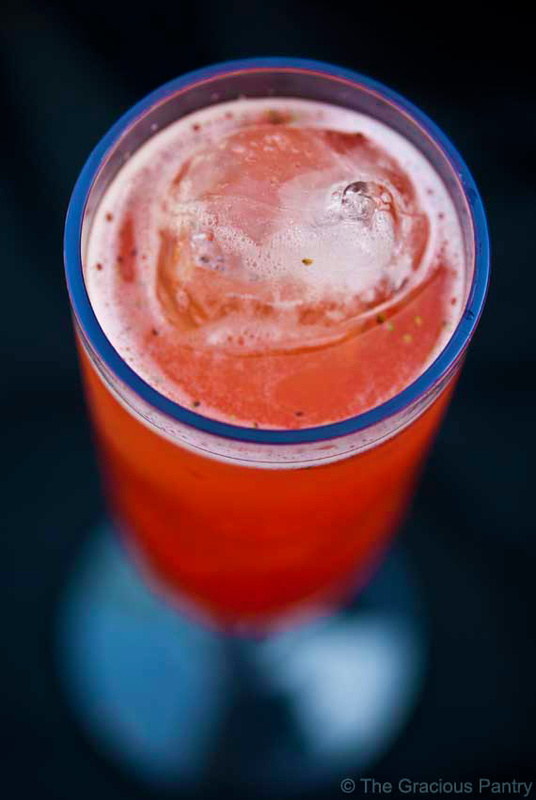 There’s just something about Strawberry Lemonade that say’s “summer is here and in full swing”. There are few things as refreshing or relaxing the midst of mind-numbing heat. But I was shocked at the grocery store when I picked up a bottle of pre-made strawberry lemonade. The amount of chemicals they add to it just to get a strawberry flavor is truly astounding. I mean, how hard is it to just add strawberries? I want strawberries, darn it! S.T.R.A.W.B.E.R.R.I.E.S.! Not strawberry “flavor” mixed with high fructose corn syrup. Why is it so hard to use the real thing? Well, if you read this blog with any regularity, you know me well enough to know that I wasn’t going to stand for that for one second. I put that bottle right back on the shelf and marched myself over to the produce section where I found some amazingly wonderful and organic strawberries. I took them home, put them through the blender, and added them (and a little lime juice) to a pitcher of homemade lemonade. I swear, some day I’m going to open a restaurant called “Real food”. And this strawberry lemonade will be listed with all the other real beverages. Wouldn’t that be a nice change of pace? Okay. I’m done ranting and daydreaming. Sorry you had to experience that. Warm 2 1/2 cups of water in a pot with the honey until well combined. In a large pitcher, combine the remainder of the water, the honey water, lemon juice and lime juice. Put your strawberries in a blender and blend until very smooth. Put the strawberries through a fine meshed sieve. You’ll have to stir and press with a spatula to get it through the sieve completely. Stir strawberry juice into the pitcher and stir well. Jodi – Lol. A “lemonade” you have to drink in the dark. Now that WOULD be interesting! I was just looking up ginger lemonade recipes, and i was thinking about emailing it to you to clean it up, but I guess I could just use Honey instead of sugar. i may try it. This sounds really good though! I will try this this weekend. Michelle – Great! Let me know how you like it! The ginger version sounds yummy! Oh this looks delish and I will be making this very soon, hopefully this afternoon! Since I garden I will soon have my own organic fresh strawberries to choose from and also keep some frozen berries on hand as well. Thank you for posting. Do you use fresh lemon juice for this? Thank you!! Your website is my new addiction, lol!! I’m so excited about clean eating, especially in my children!! I’ve noticed quite a bit how sugar is making them behave/act, and that’s where some of our behaviours have come from!! My children love sweet drinks, so I’m excited to bring some clean drinks to them!! They are getting better with water, but still want something sweet!! Amy – You can also try with 100% juice, and just water it down more and more over time. It’s tough for kids, but still completely doable. Oh thank you!!!! I’ve been dying for lemonade. When to the fair and got some there, thought it would be “just” lemonade but it was sooooo sweet. Too sweet for me to finish. I’m gonna try this, I’m sure it’ll be just what I’ve been craving. Thanks a lot. Mawasnick – Then start off with less sweetener when you make this and sweeten to your tastes. I’m sure you’ll love it! This sounds delicious. I may use seltzer water instead of regular water to have a sparkling lemonade! Lovetuscany – If that works for you, great! I get a really bad aftertaste with stevia, so I never use it. just made this… waiting for it to chill so the kids and i can have some! YUM!! Thanks for all the yummy stuff to make. we are slowly changing our lifestyle and your site helps SO much! Thanks agian! That probably did make the difference. You can also cut the honey in half. Monday – You can if you thaw them first. Jessica W – Sure! You might need to adjust the amount of lemon juice a bit, but yes. Just made this. It is so refreshing and delicious!!!! My husband even likes it! Ann – Up to about 5 days. You can freeze it in ice cube trays if you don’t drink it fast enough.